A trait of being uniquely short or tall is the thoughtfulness that occurs when we must ponder what can be seen of us from the average-heighted perspective. As a “short”, I am uniquely aware if I’ve made it too easy to peer down the front of my shirt, for example. Being short, I also consider how my clothing choices look to people at an average height perspective. Take for example, the midi-skirt. I mentioned before that I’ve been eyeing longer length skirts, and a scroll through Pinterest will yield the fashion set looking elegant and poised outside fashion shows in full midi-skirts to the shins. Most of these girls are fairly tall, with their photos being taken either at an equal to, or slightly shorter height perspective. 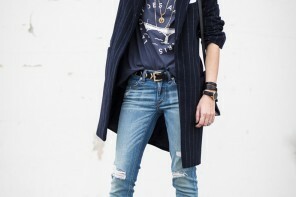 Since the average-heighted person looks downward at my outfit choices…could I do the same? Going into this photo shoot, I had a plan to show how workable the midi-skirt could look when photos were taken from a lower perspective (meaning, my trusty photog gets to crouch down, looking up at me while he takes my photos) versus the terrible disaster that would surely take place when the photos were taken from above (my trusty photog’s natural height, which is quite a bit taller than myself). Strangely, we couldn’t get a terrible looking perspective of this skirt, which I found really shocking. In fact, the most flattering angle (I thought) was from the natural perspective of average height. I use to think the same way but after I got my first midi I realized it works well with my short frame I just make sure too always wear mine with heels. You look so elegant in yours, love it! My favorite perspective is actually the second picture in the post from the back. The skirt hangs so elegantly. Love it! I absolutely love the skirt and the color and I think you can pull it off. But I feel that the outfit overall is overwhelming on your frame. I can’t put my finger on what it is – the belt that seems loose or the shirt. Maybe a more fitted, wide belt so it doesn’t seem like you’re wearing things that are too big for you? Or a tighter, short sleeved shirt? 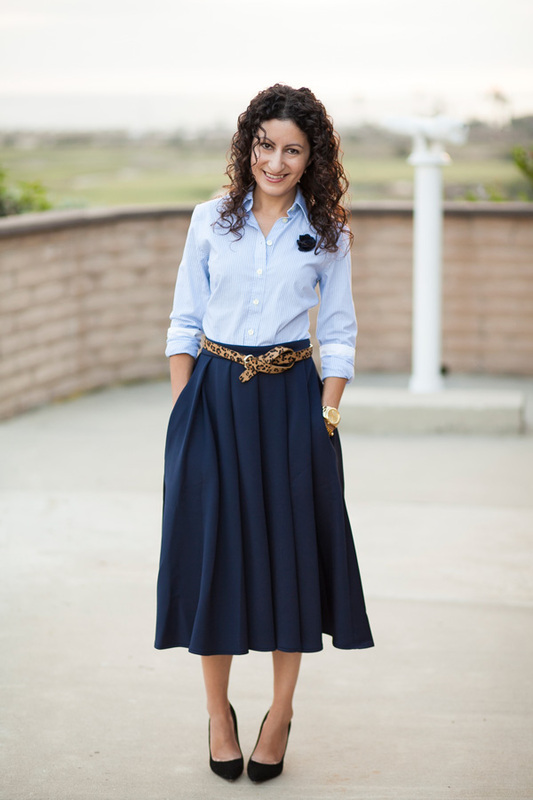 It’s interesting to see a fellow petite in a midi skirt. My initial thoughts was that there was too much material (width) in the skirt. However I do like the fact that you have added a brooch and belt to draw attention away from the skirt which helps. Maybe you could try a long midi length pencil skirt and see if it looks any better. I don’t understand how this could look like a child in adult clothes. You don’t look overwhelmed at all. 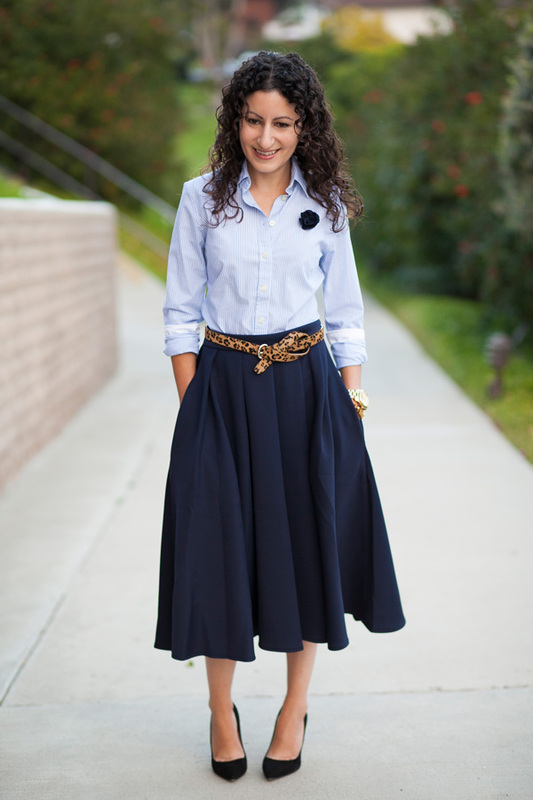 The skirt is proportioned for your size. The length is right, the fullness is right. You like heels and they work beautifully with the skirt. I do agree with the some of the others. Midi skirts can look great on petite frames, but I think this one is just a bit too overwhelming for you. I think it has a bit to do with the fullness and a little bit to do with the length. I would probably take the skirt up a few inches and it would probably work much better even with the amount of fullness the skirt has. Great belt and shoes! i think the midi is really pretty and the belt and shoe work perfectly with it but i’d have preferred a tee, or silhouette blouse or even a fitted-flattering modern vintage blouse. Sorry, I do think it looks “too big” for such a petite frame. Especially since in addition to being petite, you are very slender. If I saw it in person on another woman my size (5’1″), I would probably assume she was dressed conservatively for religious/modesty reasons… which is perfectly fine, if that’s the look she’s going for. Maybe a knit top or less conservative footwear?